It has today been confirmed that Mel Ewell, former CEO of engineering and infrastructure giant Amey, has been appointment to the Board of HS2 Ltd as a Non-Executive Director. Mr Ewell brings a wealth of infrastructure and transport industry experience from the UK and around the world. 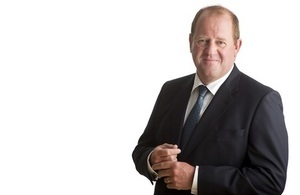 He led Amey, one of the UK’s largest infrastructure support service companies, for 15 years. During his tenure, the company delivered major road and rail projects, including the maintenance of the iconic Forth Road Bridge. Prior to joining Amey he was Managing Director at ADI group, a provider of transport and aviation services across Europe. The decision was taken by Secretary of State Chris Grayling, in line with all ministerial appointments of non-executive directors. The announcement comes as HS2 Ltd gears up to start building Britain’s new high speed rail network. Royal Assent for the London to Birmingham leg of the project is expected by the end of 2016, with construction set to begin in 2017. I am delighted to welcome Mel to the HS2 Ltd Board. HS2 is a once-in-a-lifetime opportunity to transform Britain’s infrastructure and rebalance the UK economy. We are looking for leaders with experience of large and complex construction challenges to advise our work, and Mel certainly fits that description. He transformed Amey into one of the UK’s most successful engineering and infrastructure companies, and HS2 will certainly benefit from his considerable industry knowledge. As well as the benefits of improved connectivity and capacity, the skills and knowledge gained through delivering HS2 will make Britain a world leader in infrastructure projects. HS2 is a truly exciting endeavour that has the potential transform the UK’s infrastructure industry. The opportunity to play a role in creating this legacy is s too good to miss.